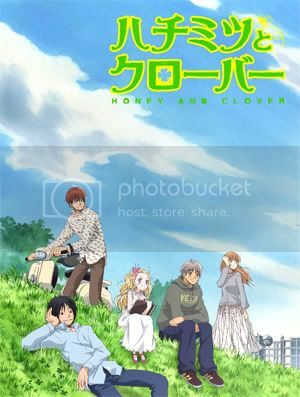 ~Eternal Snow~: Anime Review: Honey and Clover. "A six-tatami room with no bath, ten minutes walk from the college. Built twenty-five years ago, rent 38,000 yen. The walls are thin and hardly soundproof. All residents are students. The morning sun is bright since it faces east." Hanamoto Hagumi, Ayumi Yamada, Takumi Mayama. This is one series that deals with lots of human relationships, love triangles and friendships. It also shows how each individuals matures through the span of 3 years (series timespan), as they make their way through the realities of life, the hardships and joys that molds them to be who they are at the end. What I enjoy about this show is the amount of development given to each characters, it's like how a sculptor would slowly, gently, and with all the heart-felt emotions within him, create the most detailed, mind-boggling, heart-moving sculpture masterpiece of his time. As the series moves on, you grow along with the characters, feeling their emotions during both times of happiness and hardships, as most of us are abit to relate ourselves to at least one of the characters (I'm sure a huge bulk of us would be able to relate to Takemoto, including me). One of the touching moments throughout the series. 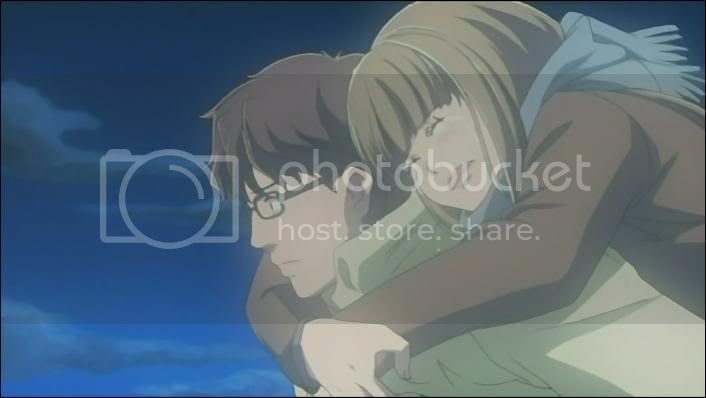 Shows how much Yamada loves Mayama, and how dearly (friends-wise) Mayama feels towards Yamada. There's also a good mix of comedy and drama, one moment you could be laughing, another you're crying. One cannot stay downcast for long as laughter takes over quite often, but once again the reality of "life" eventually sets in, sending your brain into over-clocked mode, pondering on the many decisions in real-life that we once had made, and might make in the future. As this series portrays scenarios and emotions that can easily be related to our normal lives, we get hit with lots of questions to how we had been living out our lifestyle, with the many "What ifs" that we would had asked ourselves countless times. I want to go on a journey of self-soul-searching too!! Too many things I want to clarify with my life. There were also quite a few Ferris Wheels that were featured in the series, and I believe it does carry a meaning too. Wheels can be represent as the need to move forward, to move towards a goal. 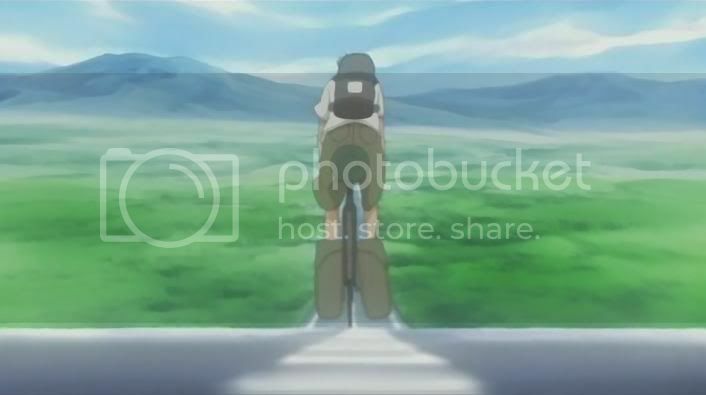 Taking one's own time, while enjoying the scenery (things around you), and slowly move towards that goal, is what I think the ferris wheel represents here. 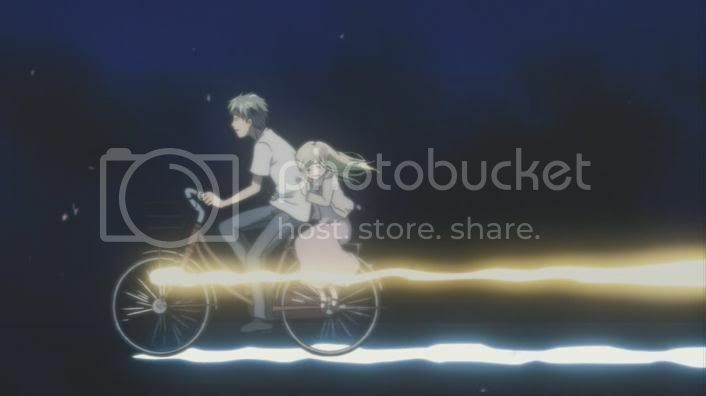 Or another way of putting it, like what Takemoto said in the series, that the ferris wheel exist to allow people to slowly cut across the sky while in the company of their significant other. The original artwork for the manga is done by Chika Umino, while the anime was done by J.C.Staff. 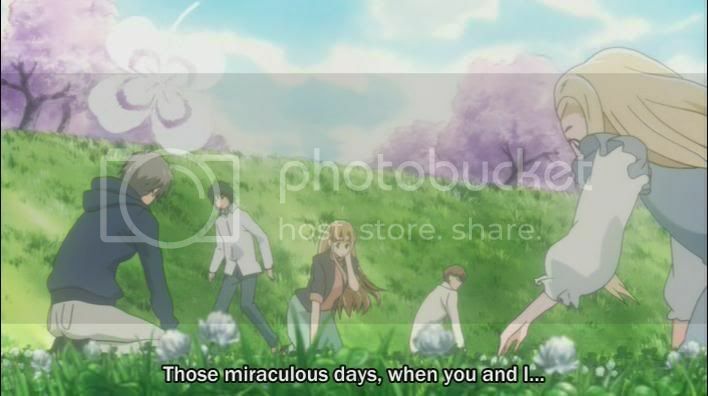 I enjoy the use of pastel colours to give the series a softer feel, and very soothing to watch. The amount of details that goes into each characters might not be much, but I definitely love how easily you can see their facial expressions, especially the detailing of their eyes. The music for this series comes mainly from two artist, SPITZ and Suga Shikao (Mayama's character design seems to be based off this guy). The songs and BGM used are very well chosen, enhancing each scene with maximum effect. Especially loved the instrumental version of Dramatic, which really sets the mood throughout the series. comments for fear of spoilers. I didn't watch this series initially, as I was slightly put off by the designs and the slice of life genre. However under constant persuasion (and pressure) by a friend, I took the plunge and never looked back. Currently my No.1 anime of all time, I had learned quite a few things from the series which could apply to real-life. This series is also quite an emotional roller-coaster, but it's worth it, and one would eventually walk away with a bittersweet ending. The defining moment of the series to me. A sweet rating of 9.9/10 (I can't give full marks due to the fact that it was so nice that I didn't want it to end ><. But eventually all things do.) and highly recommended for those who love watching dramas and love stories, and even if you're just in for the comedy it's pretty good too. This review encompass both the first and second season. Don't watch one without the other, you'll be left with a lack of proper closure. 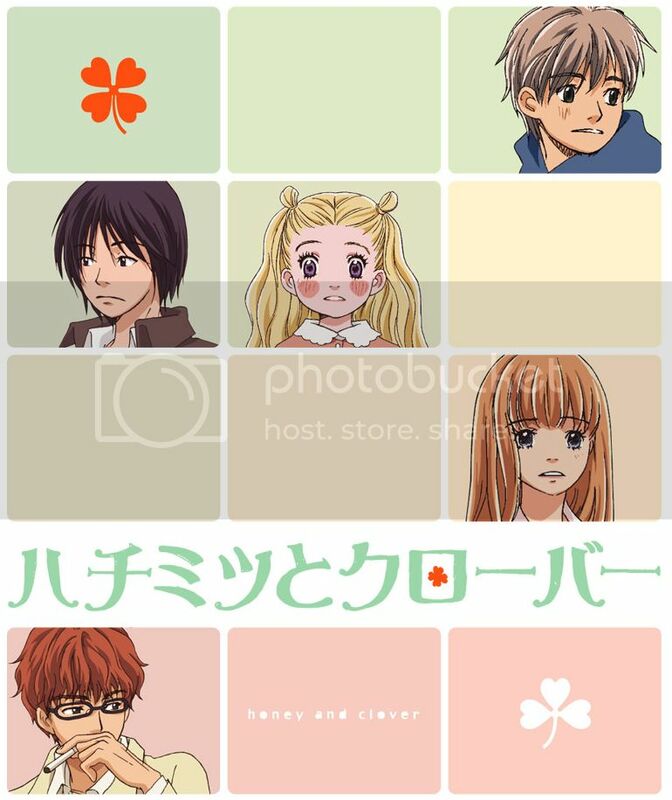 The Fuji TV version live-action version of Honey and Clover is also worth a watch, however the storyline does differ quite abit so you'll have to watch it with a pinch of salt. There's a few problems with TV version which I didn't like though, mainly I really wished I could punch the living daylights of the the actor playing Morita. I hated his sarcastic looking smile, and he doesn't play out the true personality of Morita (he's fun and crazy, but not sarcastic and an a%@hole). Another problem is the actress playing Hagu. Well she may had fit the "childlike" look role well, but the way she strings her sentences and... erm... oddly placed smiles, makes you think that she might be mentally retarded. Well they could always say that she's only 16 in real life but I doubt that would affect much. But hey! I did find her cute anyway. Attack of the Yamada Unicorn 1st Guards. I guess I'll be doing an anime review only once a month, since most other places would already have their own reviews and if you really want to find a review, it's easily found. I'm just doing one to show my appreciation for the series I love. Sorry for the lack of updates recently too, but I didn't see a point to doing a post for the sake of one while I had more important things to handle at the time being. Enjoy the 2 AMVs below, and Signing out for now. this is an old anime series i believe. release 2, 3 years ago. yea it is an old series. The first season was back in 2005, while the second season was in 2006. However the live-action drama only came out this year (Jan 2008). I believe this is still quite an underrated series, and because I simply loved it, I want to at least "introduce" this series to some of my (RL) friends who just live on Bleach and Naruto (pfft). It's even for those who writes off this series too, like I did at the start. Worth it ^^.